If you want to stay on top of what needs doing for the day, Dayboard is the tool for giving you a constant reminder each time you open a new tab. 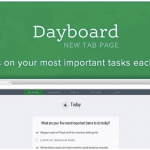 Dayboard is a Chrome extension that offers you a genius way of keeping you focussed while browsing the Web. You simply list your tasks for the day, and each time you open a new tab, instead of seeing the last sites you’ve visited, you’ll be presented with a list of your tasks. This Chrome extension only allows up to 5 tasks, so we’re talking about the most focused tasks of the day, preferably ones you know you can complete. You’ll want to sign up to get more options, such as sharing your tasks with others. The design is unobtrusive, and you can easily drag and drop to move your tasks around. Dayboard also provides links to your apps and bookmarks, making it easy for you to navigate from a new tab. Want to stay super focused? Use the focus mode to see just one task at a time, and if you’re logged in, you’ll see the history of your tasks. It’s not a to-do list in the traditional sense so if you need something more extensive, this won’t be for you. Also, there’s no option to add notes to your tasks. Is this something you that could help you stay focused throughout the day? Tweet me what you think of Dayboard.